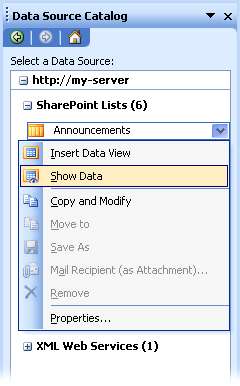 Once you have chosen a data source to work with and are ready to create a view, you can click that data source in the task pane and choose the 'Show Data' menu item. 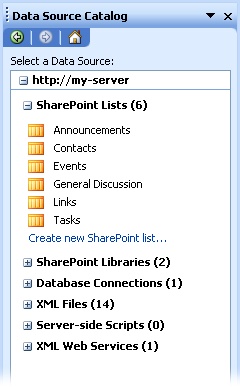 That will cause FP will navigate to another task pane called 'Data View Details' or DVD for short. The DVD is a really nifty piece of UI that will become your home for working with Data Views. 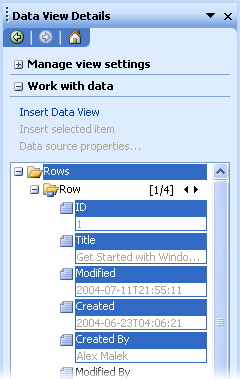 Not only can you create and format Data Views from the DVD, but it also allows you to browse the records in your data set, as well as filter/sort that data. 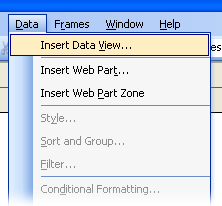 When you are ready to add a Data View to you page, simply select the fields you want to be in your view and press the 'Insert Data view' link. 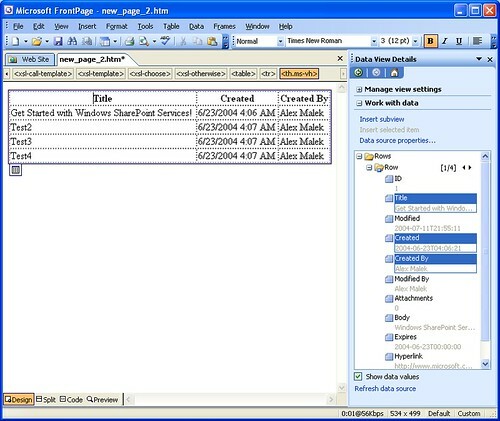 FrontPage will then insert a new Data View at the current cursor location in your page. And that's all there is to creating a Data View! 🙂 Once you have a Data View in your page, you can now format it using the regular FrontPage formatting tools.